So lovely to see the sun out at last. I have been delivering manifestos in the Esher Road and Bridge Road parts of Molesey and door knocking in Beauchamp Road. Nice to see some familiar faces there and the support has been generally very good. At Blair Avenue in Lower Green part of the ward recently, I enjoyed speaking to residents and finding out about pigeon fancying (of all things!) but actually fascinating. 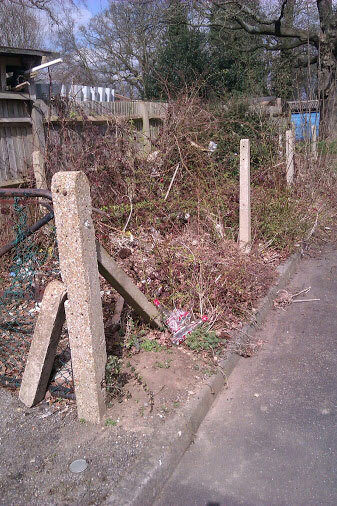 I had a closer look at the pedestrian access to Cranmere School which is being reopened. Many of the residents have been helping to clear the alley and I commend their community spirit. 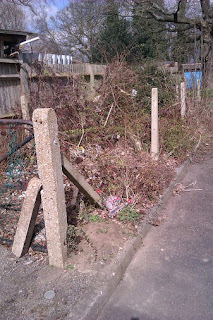 There are still some pockets of blight though, where less considerate individuals have dumped rubbish over the fence by the garages, and part of the pedestrian entrance itself (pictured here) is full of undergrowth, general debris and alcohol bottles. I am told the area often attracts young drinkers and I will discuss with the neighbourhood police team to take steps against any antisocial behaviour. I will shortly be meeting with representatives of Lower Green community centre and will raise the possibility of a community effort to clear and tidy this area.